’Tis the season to be attending many functions. The combination of long days, warm nights, and festive feelings creates the perfect atmosphere for us to be ‘at something’ most days. Even the most partiest of party animals would find it hard to sustain ‘life as usual’ with such a hectic social life. You probably don’t want to go to everything, but you also don’t want to not go to anything. So how do you choose which events, functions, and parties to show up to? How do you get the most out of the events you are attending? That’s what we’ll explore in today’s post. 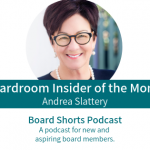 This time of year provides us with many opportunities to set and progress our board goals by getting us in to rooms alongside influential people who may be able to support us on our board journey. Caveat: I’m not saying to only attend events if you can get a personal benefit from it. Of course there will be events where you are supporting a friend or colleague or someone/something else because you want to. By all means, please go to them! Rather, this article will show you how you can use your board goals as a guide to which events you do attend so that you’re not over-exerting yourself by going to every function you’re invited to. 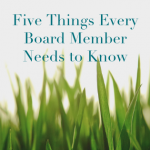 Before we get started, this article is best consumed after you have done your homework around selecting the types of boards you want to join and understanding some fundamental principles for networking for a board position. Once you’ve checked out those articles, you’re in a good position to best leverage the opportunities that the festive time of year brings. Is the event directly connected to my board ambitions? This is best illustrated by an example: if you have a desire to join the board of an animal welfare organisation, it may be a great idea to go along to their end-of-year fundraising event. For a double-whammy, why not book a table and invite key people in your network and other influencers who could also help further your board ambitions. 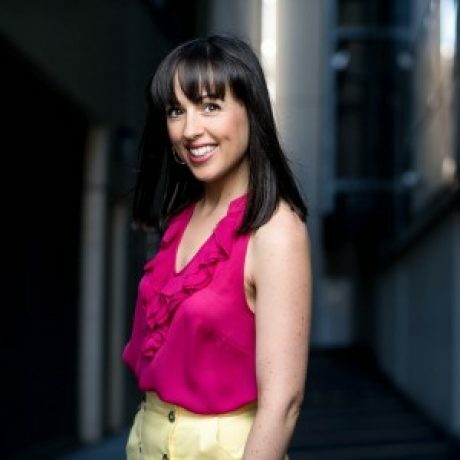 Use the event to further network with other attendees and key people within the organisation. Important side note: Don’t just do this to gain a seat at the table; continue to support the organisation throughout the year without having the expectation of getting something in return. This approach can apply to any for-purpose organisation: for example, your local women’s shelter, local sport club, or a charity close to your heart. Who is attending this function? Before attending an event where I have a purpose (i.e. to network), I usually run through a list of essentials to make sure I am fully prepared to take advantage of the opportunity and my time and financial investment. Have I selected who I want to meet, talk to, reconnect with, be introduced to, introduce to each other, etc.? Do I have my business cards prepared (tip: use cards from either your professional career, or ones you have created for the purpose of building your board career)? And am I taking enough? Do I know how I want to talk about the value I can bring to a board? Have I chosen what to wear to fit in with the event and audience? Am I prepared to not drink any alcohol (or drink a very small amount) at the event? The vast majority of the time I choose not to drink alcohol at work/business related functions. Yes, I learned the hard way. Many times. At the end of the day, you probably don’t want to go to everything, but you also don’t want to not show up to anything. It’s important to remember that you have control over your schedule. I hope this article has helped you to choose the events, functions, and parties you show up to, and how to make the most of them once you’re there. 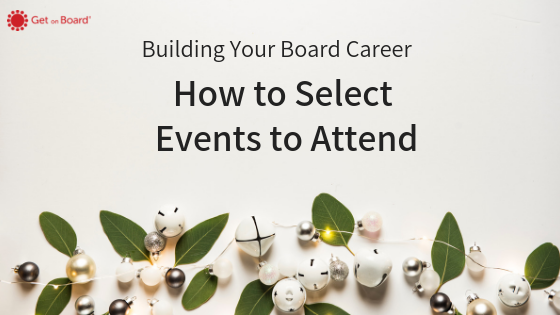 2 responses on "Building Your Board Career: How to Select Events to Attend"
Thanks for stopping by Sue. Glad you enjoyed this article.